Opened by none other than Prince Harry and Meghan Markle, the Taronga Institute of Science and Learning is a world-class facility intended to inspire the next generation of eco-scientists. Situated within Sydney's Taronga Zoo, this living laboratory contains scientific spaces, classrooms and active animal habitats. As well as providing an integrated research space for conservationists, this setup helps students connect the dots between the theory and practice of modern day conservation. Locker Group was proud to be involved in the process of bringing this fantastic structure to life, contributing to the creation of a building that personified both the innovation and values that lie at the heart of this centre. 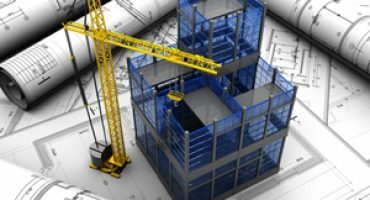 In this case study we'll describe what it was like to work on this project, and detail the successes of the finished build. The Taronga Institute of Science and Learning will be a centre of researching and study for years to come. A natural aesthetic – The facility needed to blend seamlessly with the natural surroundings of the zoo. Solid green credentials – The project was targeting a five star Green Star Design and As-Built Rating to fit with the conservation and eco-friendly stance of the institute. Locker Group was tasked with providing a variety of perforated panels for use both on the facade and the atrium of the main building. The approved design took the form of a honeycomb, which presented our team with a unique challenge. Honeycombs involve a lot of folds, however it's impossible to fold metal back on a pre-existing fold. Therefore, following a bit of research and development, we made the call to split the original panels into two. This provided a practical solution which met the architects' briefs, and gave the exterior of the building the nature-inspired aesthetic that the zoo was looking for. This effect wasn't only used on the exterior. In places, the panels flow smoothly from the exterior to the interior, providing continuity, and giving the main entry space the same grand and exciting impression. 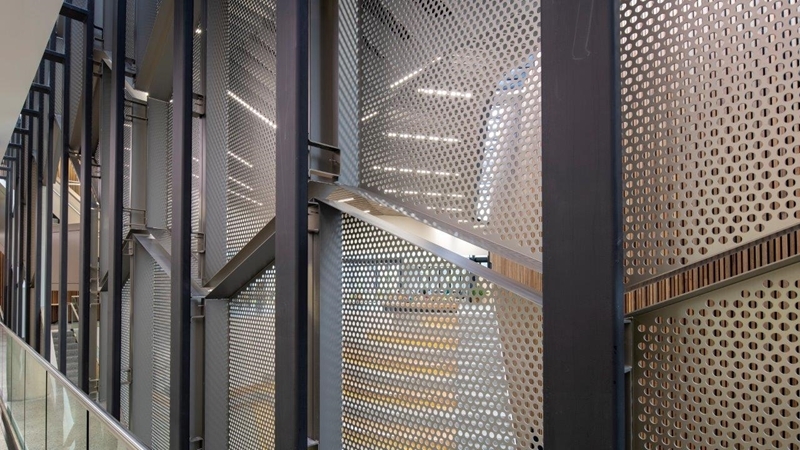 Locker Group provided a variety of perforated panels for use in both the facade and interior of the structure. Perforations are ideally suited for matching the appearance of a natural honeycomb. At Locker Group, we can customise the holes to produce different patterns as well as spacings. In the Taronga Institute of Science and Learning project this variety was put to great use, producing a visually interesting structure that's bound to capture the imagination of anyone approaching the facility. Perforated aluminium was an excellent choice in working towards the dual goals of five star Green Star ratings in both the Design and As-Built categories. Aluminium is itself among the most eco-friendly metals used in construction. It's infinitely recyclable, with nearly 75 per cent of all the aluminium ever produced still in use today, according to the Aluminium Association. 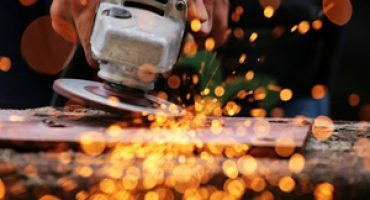 The metal also has a fantastic strength: weight ratio, meaning that it often requires less manpower and equipment to install than many of its peers. Reducing strain on HVAC systems – Perforations allow for an efficient air flow, which aids in keeping a building cool. 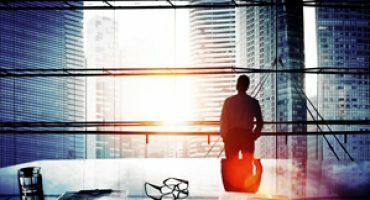 This is particularly important in large buildings during the height of the Australian summer, where HVAC systems require a lot of energy to impact the space as a whole. 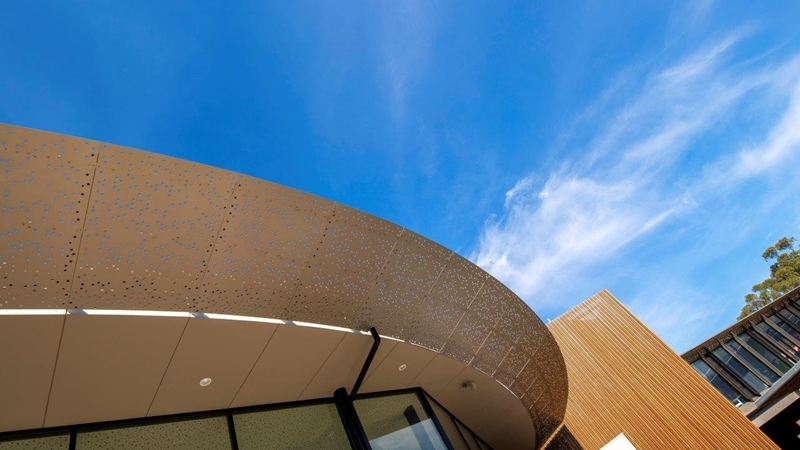 In addition, perforated metal makes for a great sun screening material – this helps reduce the amount of heat penetrating the building and also contributes to maintaining a good ambient temperature. Permitting light filtration – Perforations also enable natural light to penetrate a space more efficiently. Not only does this create a more pleasant environment for working and studying, but also reduces the need for artificial lighting, another major drain on electricity. 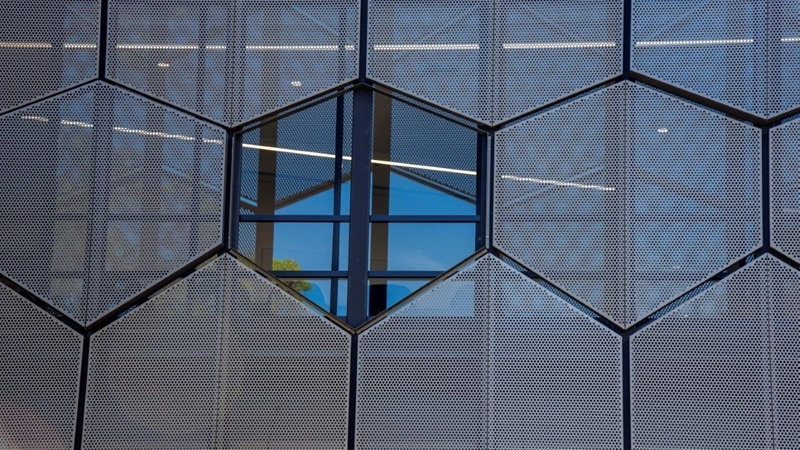 Perforated metal is an eco-friendly material that takes the strain of HVAC systems through providing sun shading, and allowing air filtration. 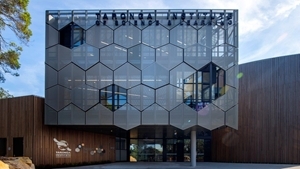 The Taronga Insitute of Science and Learning was completed in June 2018, and was officially opened in October of the same year. Recycle a minimum of 96 per cent of their construction and demolition waste. Emit 62 per cent fewer greenhouses gases than a standard Australian building. Consume 51 per cent less drinkable water than the minimum industry standards. As for the building itself, the facade is a fitting representation of the grand plans that Taronga Zoo has for its new Institute of Science and Learning. Blending beautifully into its natural surroundings, the facility offers a centre for national research and learning, and a platform for leadership in conservation science on the global stage.